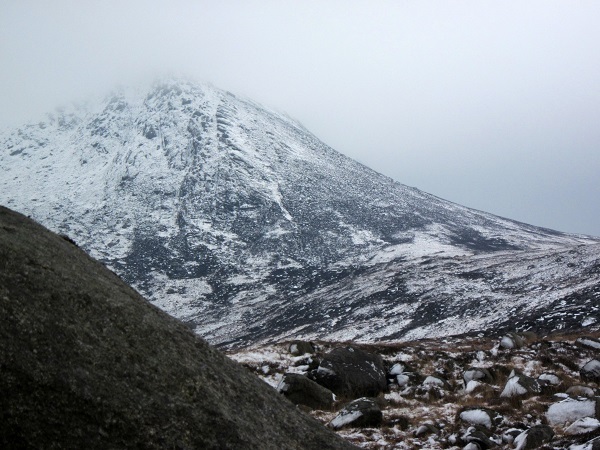 When we set out with our friend Guy Hansford several years ago on a cold, grey January to walk up Glen Rosa on the Isle of Arran, I had no idea that this was to be the start of a lengthy and quite far reaching art project. 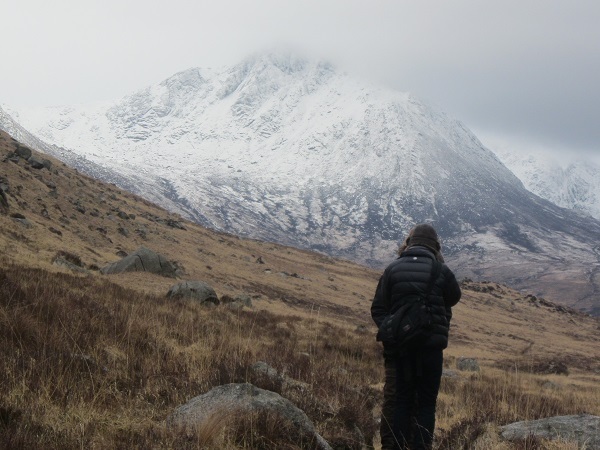 Indeed, we had walked through this magnificent Scottish glen on a good few occasions over the previous 10 years and the sole purpose of the days walk was to have a good time amongst the wild and wintry mountains of Arran. The day really was a good one with wonderful misty views up into the snow covered mountains, watching them come and go as the cloud drifted through and around the rocky peaks and ridges. At the head of the glen underneath Cir Mhor, the snow was right down to the base of the glen, creating marvellous patterns of light and dark on the rocky ground. As the walk was an easy one even for a short winter day, we had plenty of time to stop and look. A longer break among piles of snow covered boulders near the head of the glen, gave me a real chance to sit and look at this amazing array of peaks curving around us. I don’t quite know when the idea came to me but at some point that day, I realised that this was the scene I’d been looking for, for some time …… a scene that I could base a very large drawing on. A couple of years earlier while I was working in the German city of Speyer, I created a big pastel drawing of the city’s huge cathedral and on returning to Scotland had decided that I’d like to do some thing on a similar scale but based on the Scottish landscape. Now, after two years of looking, I had my subject. Just a couple of months later, I was back in Glen Rosa with the sole purpose of starting to work out how I might go about creating a very big drawing based on walking up the glen. However, as you already know, in the intervening time, I’d met Dan Thornton, a Seattle based landscape photographer and independent film maker and Nita and I had invited him and his colleague Dr David Feeney, to join us on the walk. Of course, we did a lot of talking during the day and of course I started telling them about my plans for the big drawing. By the end of that day, my plans for the work were much more advanced and what previously had seemed like a ‘maybe’ idea had now become a definite project. I would definitely be doing the drawing and it seemed highly likely that Dan and David would be making some kind of film linked to it. It was suddenly very exciting. It took me another almost two years to work out not just how to do the piece but also where to create it. 2013 saw me back in Glen Rosa with Nita in order for me to make a series of sketches and take many photos. From these and the many hours of sitting and looking and thinking, I started creating some large graphite works. These eight or nine pieces were about 125 cm x 85 cm and were important exercises in using a range of graphite sticks along with soft erasers to see if I could create large scale scribbled landscapes. …. in what would have to be double quick time! As these works progressed and it became evident that a very large work using this method would be possible, I started to work on the more practical side of the project ….exactly where to do the drawing. I wanted to create the work in a public place so that it was not just me doing a drawing but more like a performance piece. Luckily our local Harbour Arts Centre has a 5m long wall in their main gallery and so it was simply a case of persuading them to let me use if for 5 or 6 weeks. The solution was for me to offer them a traditional exhibition of paintings in the gallery spaces but to cover the big wall with paper and then for me to create the drawing through the course of the exhibition. By this time Dan was fully involved in making an hour long documentary about my work, hill walking and the role my visual impairment has played in both. 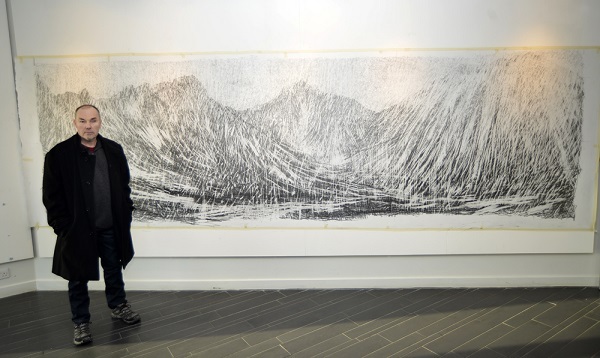 The film was to be centred on the Glen Rosa drawing project. With the drawing completed, I decided to offer it to North Ayrshire Council and they have been great in helping to promote it. One off shoot of this is that they have recently had a full size (5m long x 1.5m high) print made and this has been laminated onto aluminium panels and sited in the centre of Irvine. I have to say that I am very pleased with the result and it’s a great way of promoting my work. Finally, the drawing is going over to the Isle of Arran Distillery Visitor Centre for two months starting in a few days on 1st September. The distillery is in Lochranza at the north end of the island and is situated right beneath the mountains that the drawing is based on. It’s probably only a few miles as the eagle flies, from the distillery to the head of Glen Rosa. So then, full circle …with Dan and one of his crew flying in from Seattle tomorrow to film the final shots of the documentary ….the drawing going to Arran. Please spread the word and do pop in to the Isle of Arran Distillery Visitor Centre to see the drawing if you are over on the island between 1st September and 31st October. Prints of the big drawing will be available for purchase at the distillery or can be bought direct from my studio. << Previous Post: 10 hours of quiet after 2 weeks of running around! wow Keith. This looks amazing and all very exciting story. I will definitely go and see it and recommend to all my friends.